The makes of the cars read like a Debrett’s of the automobile world: Bugatti, Hispano-Suiza, Talbot-Lago, Panhard-Levassor, Maserati, Ferrari, Delahaye, Delage. 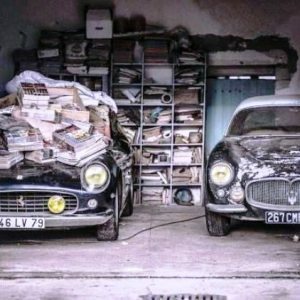 They are a hoard of 60 classic cars discovered on a farm in the west of France. They include a Ferrari 250 GT SWB California Spyder – one of only 37 to be built which belonged originally to the French screen legend, Alain Delon. The Spyder alone is expected to sell for around €12m (£9.4m) when the trove is auctioned in Paris in the New Year. Detective work by two auctioneers located the cars last month after they had been “lost” for more than 30 years in a series of ramshackle farm shelters in western France. 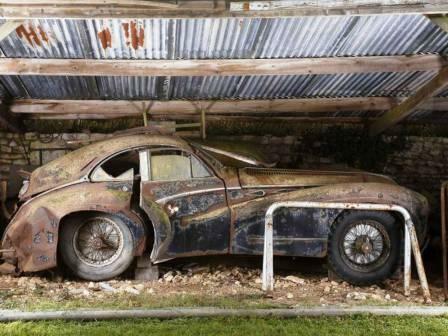 Matthieu Lamoure, the managing director of Artcurial Motorcars, said that the discovery was the mother of all “barn finds” . “We found ourselves overcome with emotion,” he added. “Probably much like Lord Carnarvon and Howard Carter on being the first people for centuries to enter Tutankhamun’s tomb. It really was a case of waking up Sleeping Beauty.” At least three of the cars are known to have belonged to celebrities. The Ferrari California Spyder, built in 1961, was owned by Delon. In 1964 he was photographed several times at the wheel of the car with Jane Fonda and Shirley MacLaine by his side. A Talbot Lago T26s “Grand Sport Aérodynamique” – one of several Talbot Lago T26s in the collection – once belonged to King Farouk of Egypt (1920-1965). In early February the cars will be sold at the Retromobile Salon in Paris in the condition in which they were found. They were collected, mostly between 1955 and 1965, by a French transport tycoon, Roger Baillon, who set out to create his own automobile museum. When his business ran into trouble in 1977, Mr Baillon sold 50 of his cars. It was assumed at the time that the whole fleet had been disposed of.